Duan, Shu-Chao Kan, Ming-Xian Xiao, Bo Xu, Qiang Yang, Long Wang, Gang-Hua Huang, Xian-Bin and Xie, Wei-Ping 2018. Numerical modelling of inverse wire array Z-pinch magnetic reconnection. AIP Advances, Vol. 8, Issue. 5, p. 055018. Beyene, Fekireselassie Artemyev, Anton V. Angelopoulos, Vassilis and Vasko, Ivan Y. 2018. Three dimensional analytical model of dipolarizing flux bundles. Physics of Plasmas, Vol. 25, Issue. 8, p. 082901. Lu, San Pritchett, P. L. Angelopoulos, V. and Artemyev, A. V. 2018. Magnetic reconnection in Earth's magnetotail: Energy conversion and its earthward–tailward asymmetry. Physics of Plasmas, Vol. 25, Issue. 1, p. 012905. Li, Hongbo Liu, Yu Liu, Jihong Elmhamdi, A. and Kordi, A.-S. 2018. Two Energy-release Processes Observed in the Eruption of a Confined Filament System. Publications of the Astronomical Society of the Pacific, Vol. 130, Issue. 994, p. 124401. Lingam, Manasvi and Comisso, Luca 2018. A maximum entropy principle for inferring the distribution of 3D plasmoids. Physics of Plasmas, Vol. 25, Issue. 1, p. 012114. Allanson, Oliver 2018. Theory of One-Dimensional Vlasov-Maxwell Equilibria. p. 137. Priest, E. R. Chitta, L. P. and Syntelis, P. 2018. A Cancellation Nanoflare Model for Solar Chromospheric and Coronal Heating. The Astrophysical Journal, Vol. 862, Issue. 2, p. L24. Allanson, Oliver 2018. Theory of One-Dimensional Vlasov-Maxwell Equilibria. p. 1. Janda, Artur Z. 2018. Exact solutions and singularities of an X-point collapse in Hall magnetohydrodynamics. Journal of Mathematical Physics, Vol. 59, Issue. 6, p. 061509. Ross, Johnathan and Latter, Henrik N 2018. Dissipative structures in magnetorotational turbulence. Monthly Notices of the Royal Astronomical Society, Vol. 477, Issue. 3, p. 3329. Hosseinpour, M. Chen, Y. and Zenitani, S. 2018. On the effect of parallel shear flow on the plasmoid instability. Physics of Plasmas, Vol. 25, Issue. 10, p. 102117. Miloshevich, George Lingam, Manasvi and Morrison, Philip J 2017. On the structure and statistical theory of turbulence of extended magnetohydrodynamics. New Journal of Physics, Vol. 19, Issue. 1, p. 015007. Fruit, G. Louarn, P. and Tur, A. 2017. Electrostatic drift instability in a magnetotail configuration: The role of bouncing electrons. Physics of Plasmas, Vol. 24, Issue. 3, p. 032903. Zenitani, Seiji Hasegawa, Hiroshi and Nagai, Tsugunobu 2017. Electron dynamics surrounding the X line in asymmetric magnetic reconnection. Journal of Geophysical Research: Space Physics, Vol. 122, Issue. 7, p. 7396. Che, H. 2017. How anomalous resistivity accelerates magnetic reconnection. Physics of Plasmas, Vol. 24, Issue. 8, p. 082115. Borissov, A. Kontar, E. P. Threlfall, J. and Neukirch, T. 2017. Particle acceleration with anomalous pitch angle scattering in 2D magnetohydrodynamic reconnection simulations. Astronomy & Astrophysics, Vol. 605, Issue. , p. A73. Bykov, A. M. Amato, E. Petrov, A. E. Krassilchtchikov, A. M. and Levenfish, K. P. 2017. Jets and Winds in Pulsar Wind Nebulae, Gamma-Ray Bursts and Blazars. Vol. 62, Issue. , p. 235. Lingam, M. Hirvijoki, E. Pfefferlé, D. Comisso, L. and Bhattacharjee, A. 2017. Nonlinear resistivity for magnetohydrodynamical models. Physics of Plasmas, Vol. 24, Issue. 4, p. 042120. The reconnection of magnetic fields is one of the most fascinating processes in plasma physics, responsible for phenomena such as solar flares and magnetospheric substorms. The concept of reconnection has developed through recent advances in exploring the magnetospheres of the Sun and Earth through theory, computer simulations and spacecraft observations. The great challenge in understanding it stems from balancing the large volumes of plasma and magnetic fields involved with the energy release with the physical mechanism which relies on the strongly localized behavior of charged particles. 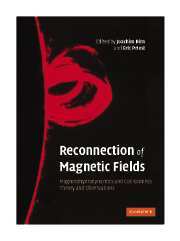 This book, edited by and with contributions from leading scientists in the field, provides a comprehensive overview of recent theoretical and observational findings concerning the physics of reconnection and the complex structures that may give rise to, or develop from, reconnection. It is intended for researchers and graduate students interested in the dynamics of plasmas.